Introducing our most popular public speaking course. Suitable for all levels, this course takes you on an unforgettable journey towards becoming a truly confident and engaging speaker. At only €350 this is the best valued course you will find. 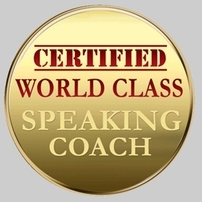 Over 2 months (and 8 classes) you will experience a real and lasting transformation in your speaking skills. No prior speaking experience is required. Student discounts are available (contact us for details). Course Begins: Tuesday May 7th 2019 for 8 consecutive Tuesday evenings (7.30pm - 10pm) Dublin City Centre. NOTE: You will receive a certificate of completion when you successfully complete this course. 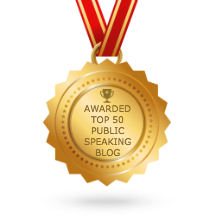 Speechcamp's Public Speaking Blog has been chosen by FeedSpot to appear in its Top 50 Public Speaking Blog List. ​Click here to pick up powerful tools, tips and techniques in our Speechcamp Public Speaking Blog. Click on the logo to the right to find the best Public Speaking Blogs on the planet. Our brand new Free Audio Downloads page is open. Expect to see new episodes added over the coming weeks. Also, click on the button below to download a free workbook that will help you measure your speaking skills and set goals for the future. NOTE: Before contacting us, read our updated Privacy Statement to understand how we use your contact details.